HONG KONG - For more than two decades, the Catholic Church in the Philippines, Asia's only predominantly Catholic country, has opposed a Reproductive Health Bill that seeks to give poor people access to free contraceptives. The issue, Archbishop Socrates Villegas said in a statement, should be decided by "faith not opinions". But amid the raging faith-versus-opinion debate, statistics reveal that the population of the Philippines is exploding. According to the United Nations Population Division, at the current rate of growth, the 93 million people now living in the country could grow to 100 million by 2015, and 150 million by 2050. Many fear that the Philippines will not be able to support so many people. In the long term, the trend creates challenges not only for policymakers, but also countless poor families that support multiple children. But ironically, high-fertility countries - nine in all including Laos, Cambodia, Afghanistan and Iraq - are becoming fewer in Asia. In fact, low fertility has become a phenomenon in a number of countries on the continent - the Chinese mainland, Japan, Vietnam and Thailand. In all, 19 out of 51 countries fall under that category in Asia, a continent that accounts for more than half of the world's population. The inevitable outcome of the falling fertility trend, a hallmark of many nations in Europe, is swelling elderly populations. 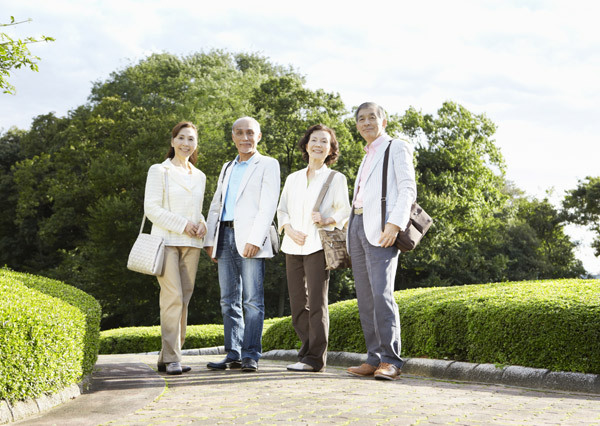 A United Nations study cited by the Asian Development Bank says Asia will have 859 million people age 65 and older by 2050, up from 269 million in 2010. The extreme case is Japan, where fertility has long dropped below the replacement rate, and the population is now dwindling. The current population is 126.5 million, but could drop to about 110 million by 2050. India and Indonesia belong in the medium fertility category. Less than one-fifth of the world population lives in a high-fertility country. Developed countries typically have low birth rates. A similar pattern is emerging in Asia. Higher-income countries and regions like South Korea, Singapore and Hong Kong have low birth rates along with high incomes. All of Europe and most of the Americas are "low fertility". "On the whole, fertility is declining rather rapidly in Asia," said Christophe Lefranc, a Bangkok-based technical adviser on census and data with the United Nations Population Fund. New numbers from the World Health Organization (WHO) suggest considerable changes in demographic patterns in Asia that can have a direct effect on economic development. There may actually be a "demographic bonus" in a dwindling population, according to experts. "As the size of the actual labor force grows, fewer people depend on it. This is not yet the case in Japan, which faces an increasingly onerous demographic debt," says Toru Suzuki of the National Institute of Population and Social Security Research. The population patterns in most countries in the region are such that, in a matter of years, the size of the labor forces in those places will shrink and the number of people depending on them such as retirees and children will balloon. Suzuki, however, adds that the demographic factor doesn't have an immediate effect on an economy. "Demography works in the background of the economic trajectory," he says. In China the family-planning policy that encourages most families to have a single child has been successful but created other problems, the most significant being a relatively older population. Almost half of its people are over the age of 40. This means that at some point in the near future the workforce may be too small to support everybody. Analysts and forecasters fear dangers will arise if the trend continues. For now, however, there appears to be progress in a number of areas - if progress is defined as healthier populations who are living longer. In the Western-Pacific region, which includes China, Australia, Japan and most Asia-Pacific countries, including the Philippines, the average life expectancy rose from 69 in 1990 to 75 in 2009. In Southeast Asia, which includes India and a number of poorer countries, the average life expectancy rose from 59 in 1990 to 65 in 2009. Even in some of the poorest countries, life expectancy has gone up from 52 years to 57 while people in lower-middle income countries now live an average of 68 years, up from 63. However, an older population puts strain on a country's finances and the labor force that has to support it. Pensions may also be an issue if there are more people drawing on them than paying into them and the pool of reserves available is not deep enough. China's population will likely peak around 2030, at around 1.4 billion. On the other hand, India, which has a relatively higher fertility rate and a much younger average population, could top out 30 years later at 1.7 billion. In China, the average age is too high and the aging of the population is "the fastest in history", according to Sajeev Sanyal of Deutsche Bank, who published a paper titled The End of Population Growth. Sanyal, a global strategist at the bank, says the size of China's workforce will peak in the next few years and collapse in the 2030s after a decade of decline. It is too late to reverse the trend as China is "past the tipping point because of a combination of gender imbalance and a skewed age structure", he adds. "Nobody is really prepared for these demographic shifts. One challenge created by an older population is the cost of healthcare. As you become older you are less able to look after yourself," says Thomas Abraham, director of the public health communication program at Hong Kong University. "In terms of public health, the question is whether increases in population are met with greater access to health services," he adds. In the next 15 years, global fertility may drop to the replacement rate - the point at which populations stay flat. Workforces across the continent will likely begin to drop, and, as a result, people in Asia may work longer. This will lead to a higher retirement age. Working to the age of 70 is a likely prospect for the current labor force, according to Deutsche Bank. In just a few months, the world's population will reach 7 billion, according to the United Nations Population Division. The population will likely climb to 9.3 billion by 2050 and top 10 billion by the turn of the century. A number of factors play into changing demographic patterns and they could make things difficult for policymakers. Improved health and healthcare is one. According to WHO statistics, people now earn more and have easier access to healthcare, education, clean drinking water and vaccinations. More people across Asia now receive vaccines. Measles vaccination rates are 95 percent in the Western Pacific region and 76 percent in Southeast Asia, up from 85 percent and 58 percent in 2000 respectively. These developments have a direct effect on the lifestyles of people in the region who are living longer and healthier lives. And in turn, these also have a positive effect on economies because healthier and more educated people are more productive.The irony, however, lies in the fact that healthy and longer lifespans presage a potential disaster. The indications are quite clear, even from affluent Asian countries such as Japan, South Korea and Singapore. The challenge is a double-edged sword. Clearly, policymakers have a formidable task at hand.